Cancellation policy: Cancellations must be submitted by May 10th 2019. SATLOG, the last piece in the puzzle? The Exploration Innovation Prize is awarded a license group, company, team or person who during the last two years have given a courageous and innovative technological contribution in exploration for oil and gas on the Norwegian continental shelf. The recipient has matured and exploration technology with high potential leading to increased G&G knowledge or future commercial oil & gas discoveries. Nominate YOUR candidate by February 28th 2019. The jury for the Exploration Innovation Prize (EIP), will select the top candidates that advance to an open poll. In the open poll, you can vote for your favourites among the candidates. The polling results will advise the committee in their selection of the three candidates who will be invited to present the technology and its impact at the conference in May 2019. The jury selects the winner after the presentation at the conference, and the prize is awarded in the prize ceremony the same evening. TopSeisis a next-generation marine towed-streamer acquisition solution, delivering a step-change in imaging for shallow to intermediate depth targets by providing massively increased near-offset coverage from a split spread with zero offsets. It is the outcome of five years of technical collaboration between CGG and Lundin Norway AS, with additional funding from the Norwegian Research Council. The first full-scale 2000km2commercial survey over the Loppa High in the Barents Sea was acquired in 2017 with the first processing finished in 2018 providing excellent results compared to the conventional data in the area. An even larger 5000km2 Multi-Client survey over Greater Castberg in the Barents Sea is planned in the summer of 2019.
eSeismic was developed by PGS in cooperation with Equinor and the Norwegian Research Council. 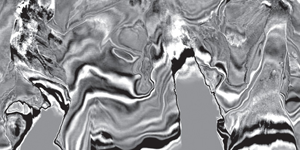 The method reinvents seismic acquisition and processing, producing an ongoing lower-level ripple of sound, rather than the traditional series of large distinctive impulsive pops. A recent field trial confirmed the benefits of recording continuous source and receiver wavefields, including reduced environmental impact, improved efficiency and better data quality. The classic cocktail party problem — how a human can filter out a voice of interest from other voices in a crowded room – has its parallel in seismic acquisition. In a seismic survey, the Earth’s response from one seismic source can be filtered out from many seismic sources fired simultaneously. The trick is to use periodic time delays while shooting. 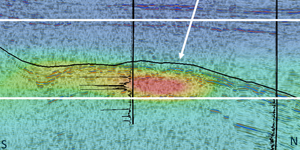 Recorded seismic data are transformed to the spectral domain, where individual source contributions reappear in blended multiple copies at separate wavenumber locations, allowing for exact separation in an optimally wide bandwidth, according to the signal apparition technique developed by the inventors. Signal apparition is a game-changing advance for highly cost-effective simultaneous source acquisition. It allows time and cost savings by faster acquisition, or denser sampling on the source side for improved seismic imaging. 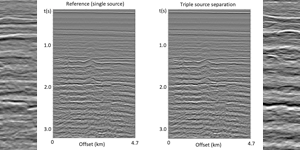 Further, the application of signal apparition gives seismic data with low-frequency content fitting for full-waveform inversion and velocity model building. To date, field projects with 2, 3 and 6 simultaneous sources have been carried out on the NCS for OBN, PRM and streamer seismic. 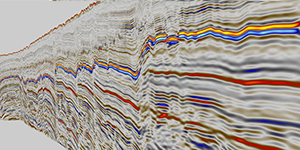 Earth Science Analytics (ESA) is developing the next generation software platform that is enabling geoscientists to use artificial intelligence and machine learning for hydrocarbon exploration. ESA’s EarthNet platform enables faster, less expensive and more accurate prediction of subsurface rock and fluid properties compared to traditional methods. The company was awarded Subsea Upcoming Company of the Year 2018 by GCE Subsea and has recently been announced to be a winner in the prestigious British Oil & Gas Technology Centre challenge “Can machine learning help unlock the full potential of the North Sea?" With short offsets, dense streamer spacing in combination with a high-frequency seismic source, P-Cable 3D Seismic AS has been able to acquire dense CMP coverage with bin sizes as low as 3 m. This is a significantly better resolution than broadband-processed conventional 3D marine seismic. 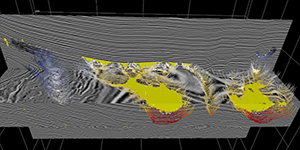 The P-Cable system can be used for both high-resolution 3D acquisition, as elegantly demonstrated in Jurassic fault block prospects in the Barents Sea resulting in data with extreme resolution, and 2D regional surveys where wide-azimuth illumination and high-fold lead to crisp, detailed high-resolution 2D marine seismic profiles. 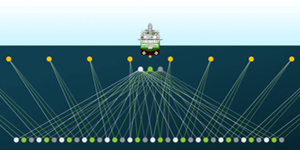 The unique cross-cable design also enables quick deployment of the complete spread of eighteen streamers. 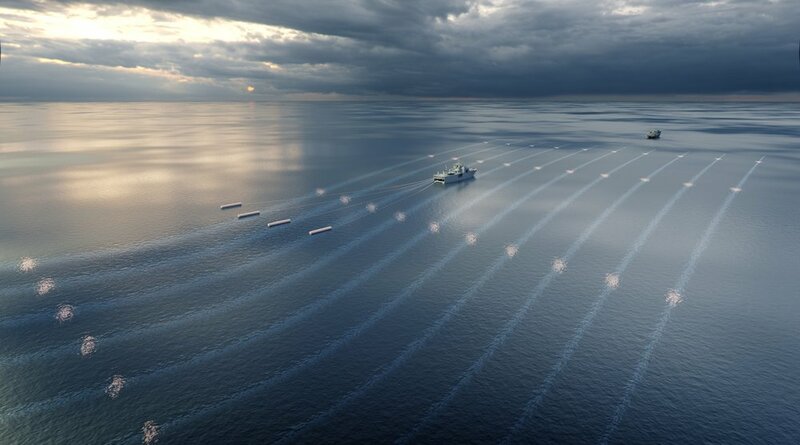 EMGS has been working on a Joint Industry Project (“Deep Blue”), supported by Shell and Equinor, for developing the Next Generation EM equipment. In 2016 a prototype of the new equipment set was successfully tested offshore Norway. The first commercial survey was performed in July 2017. 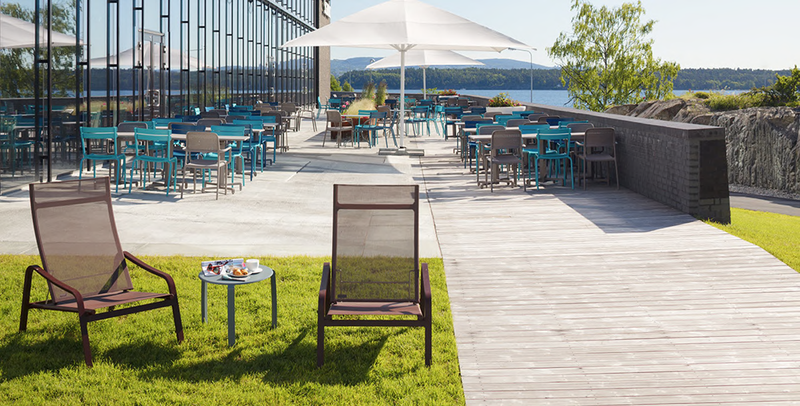 Deep Blue has been used actively in Norway throughout 2018, especially for mature basin surveys in the North Sea and the Norwegian Sea. Deep Blue increases the depth of investigation well beyond the capabilities of the conventional source systems with a general depth increase of imaging capacity of 1500 meters more than the conventional system. 4500 meters is considered the “new floor” of EM imaging capability. The new source also increases imaging confidence and resolution for targets that can be detected with the conventional source system. Deep Blue can operate in water depths up to 4,000 meters. All data acquired with Deep Blue confirms the ability to increase sensitivity and resolution through a combination of higher source output, increased frequency bandwidth and better accuracy, which allows imaging deeper and smaller targets. 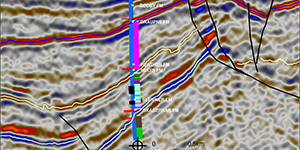 OMVs horizontal appraisal well on the Wisting discovery in the Barents Sea is the first subsea ultra-shallow reservoir extended well. It is also the world’s shallowest horizontal well drilled from a floating drilling facility. Water depth at Wisting is 402 meters. The well started vertically and was successfully steered into a horizontal orientation within a 250 meters depth interval. The total well length is 2,354 meters and the horizontal section measures 1,402 meters. The well was spudded on January 15, 2016, by the semisubmersible rig Transocean Spitsbergen and the well- test was finalized at the end of March 2016. The well is a prime example of an innovative and courageous move to understand the reservoir in an early exploration phase. In many wells, hydrocarbon saturations are masked due to mechanical failure of drilling or logging equipment, overbalance in the drilling mud or poorly calibrated resistivity logs. In critical cases, discoveries may have been totally overlooked. 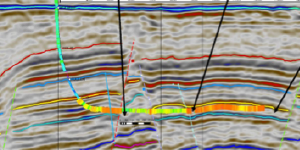 Two years ago, Searcher Geoservices AS began to develop a missed pay analysis (SATLOG) based on composite, conventional well data. The results are extraordinary. The conclusion drawn is that there are still many missed pay opportunities on the Norwegian shelf. The obvious question is then why no one has seen and grasped these before? Searcher Geoservices has since 2016 digitized all of the available analogue well data on the Norwegian shelf. Logs from over 300 wells are ready, and the total database currently represents nearly 1,200 wells. The database is available for use in any interpretation program. Triple source in towed streamer 3D seismic acquisition has become a solution to increase spatial resolution between the streamers. In 2014, Jan Langhammer (TGS), Pete Bennion (TGS) and Phil Fontana (Polarcus) revisited the idea how to in practice utilize the concept of triple source to get 50% denser crossline sampling at no extra cost. Using three sources, while still maintaining the in-line sampling density and record length per sub-surface sampling line means that shorter shot spacing is needed with overlapping shots. The first commercial triple source acquisition was conducted in 2015 in the TGS survey EUR15 MC3D in the Barents Sea utilizing a Polarcus vessel. Today triple source has become the preferred and standard delivery by all major seismic companies. The idea of triple source has paved the way to increase the number of sources and firing schemes of sub-arrays to increase sampling.